The original Letscho Recipe is from Hungary and called Lecsó. Letscho is a traditional Hungarian meal prepared with tomatoes, peppers, onions, spices, and sliced sausages like Kolbasz, Kielbasa, and Debreziner. It is served with bread. I prepare the Letscho without the sausage and serve it as a side dish to fried pork or veal cutlets and Spaetzle or to grilled pork meat. 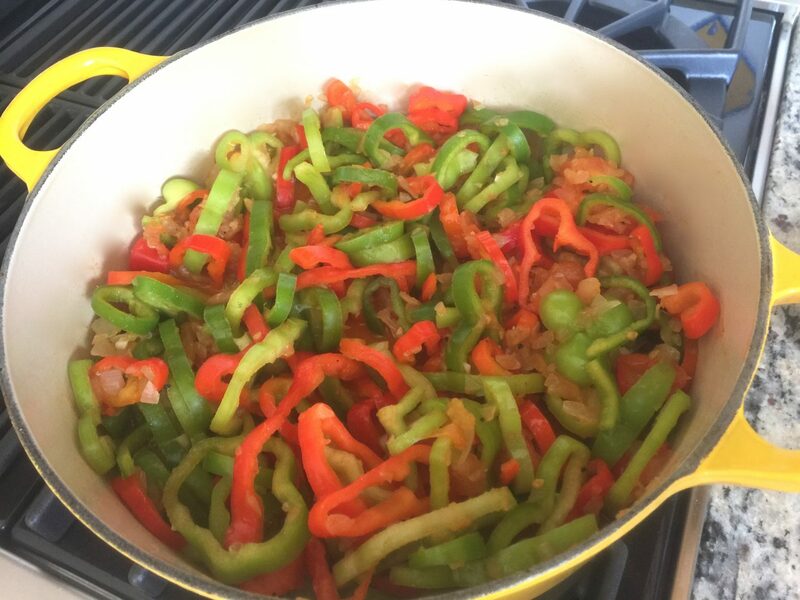 Wash the peppers and cut them into rings. Remove the seeds and set aside. Peel the tomatoes; take the core out, place the tomatoes in a bowl and pour hot water into the bowl. Let the tomatoes stand in the water for a few minutes, and it will be easy to remove the skin. Once the tomatoes are peeled, cut them into cubes, and set aside. Heat the oil in a saucepan. Add the cut bacon and fry until the bacon fat melts. 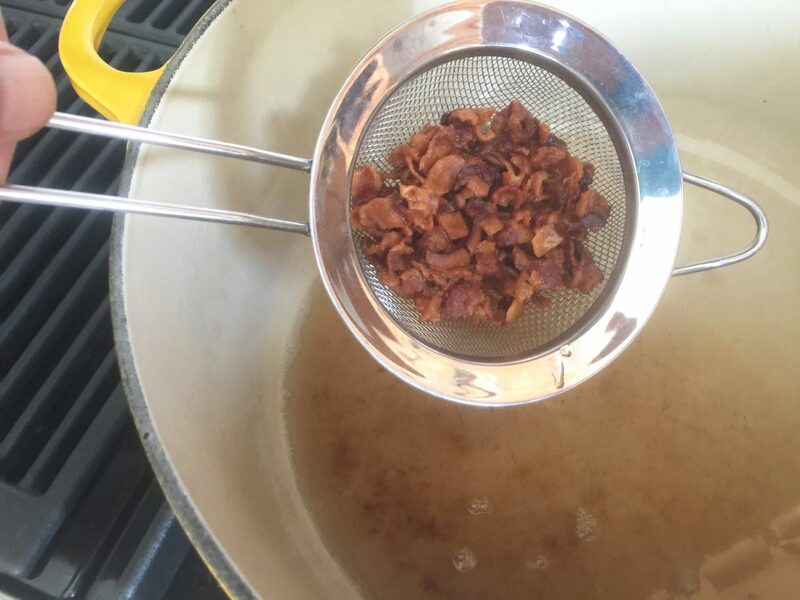 Take the leftovers bacon out of the saucepan using a tablespoon and a sieve. Fry the diced onions in the bacon fat until they are transparent. 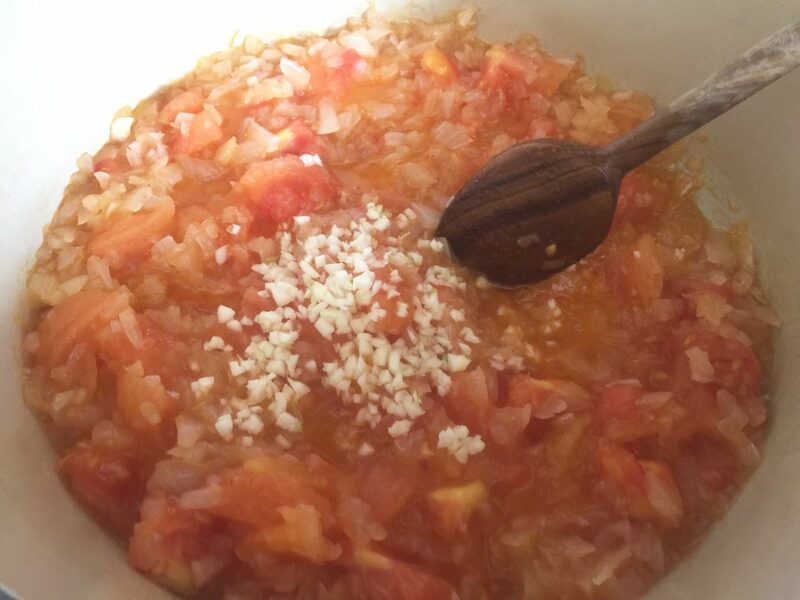 Add the diced tomatoes into the saucepan and boil until the tomatoes build up liquids. Add the diced garlic cloves, spices, and ¼ cup of water. Mix all the ingredients well, then add the peppers to the saucepan. Fill the saucepan with more water if needed, but not more than ½ cup. Bring to a boil, turn the heat down and let it simmer for 20 minutes. Wash the meat under running water and dry it with a kitchen paper towel. If the slices of meat are too large, cut them in half. Mix flour, salt, paprika, and pepper on a plate. Roll the meat in the flour mixture. Melt the butter in a skillet. Fry the sliced pork or veal cutlets for 3 – 5 minutes on each side. Note: If you want to add sausage to the Letscho, cut the sausage into small slices. When the Letscho has cooked for 20 minutes, add the sausage to the peppers and mix well. Bring to a boil, turn the heat down and let it simmer for another 10 minutes. Best Perennial Garden Flowers – My Garden Your Paradise 17 sensational Salad Recipes to accompany a season of grilling.